Google Insights for Search is a free beta product that harnesses the vast quantities of search data that Google harbors and thrives on. Guess what? You can thrive on it, too. One of the simplest and most effective applications of Google Insights for Search is to find out how to word your advertising message and where to target it. This is most applicable to AdWords campaigns, but the insight you’ll gain can be valuable for other forms of marketing as well. In this groovySeries, we’ll show you how to choose and target your advertising message with the help of Google Insights for Search on and off the internet. First Example: What’s the hot smartphone platform in my market? Let’s say you run a software company that focuses on mobile apps/games. Looking over the next 3 months, as the owner of the company your team wants to know what platform you should focus on first including advertising. Should you go all-out on the growing iPhone platform? Try to capture the growing Android market? What about BlackBerry? Obviously, the best answer is a mix of all three, but how should you divvy up your time and budget? And what part of the globe should you focus your advertising on once your ready to launch? Google Insights for Search is designed to answer these exact types of question. Google Insights for Search allows you to compare the level of interest for any given search terms across any given region. For this example, we already have our three search terms: iPhone, Android and Blackberry. Let’s see which is most popular. 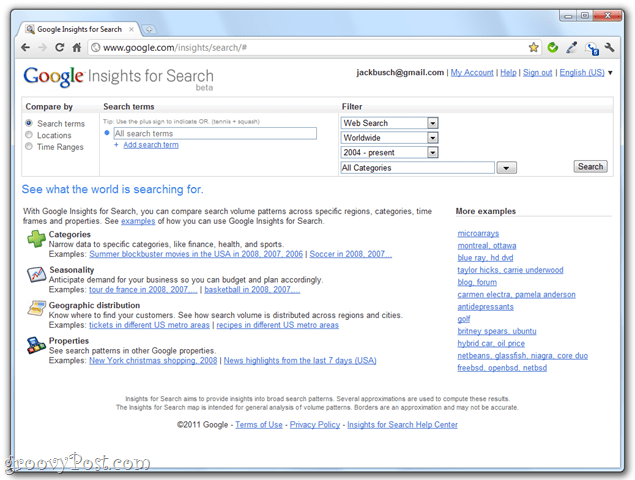 Navigate to Google Insights for Search by pointing your browser to google.com/insights/search/. Select Search terms under “Compare by” and then enter your search terms in the boxes to the right. To add a search term, click Add search term below the input boxes. 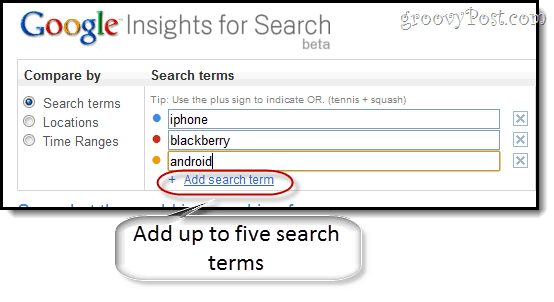 You can compare up to five search terms. Next, move over to the filter section. Let’s go with Web Search for now. 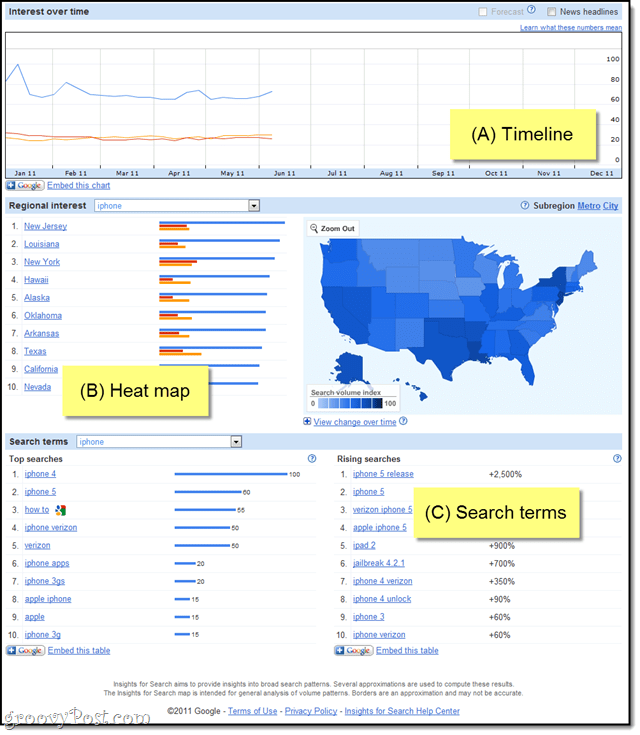 By default, Google Insights for Search compares worldwide search activity dating back to 2004. That’s a bit broad for example. Let’s say that our cell phone store only serves customers in the U.S., so let’s choose United States for now. And let’s bump up that year to be more current—let’s choose 2011. We want to know what’ s hip today, not what was cool last year. You’ll have an opportunity to tweak this later. It’s best to start broader and then drill down, which we’ll do later. Click Search or press Enter when you’re all set. Timeline – Shows interest for each search term over time. Heat map – Shows regional interest for each search term. 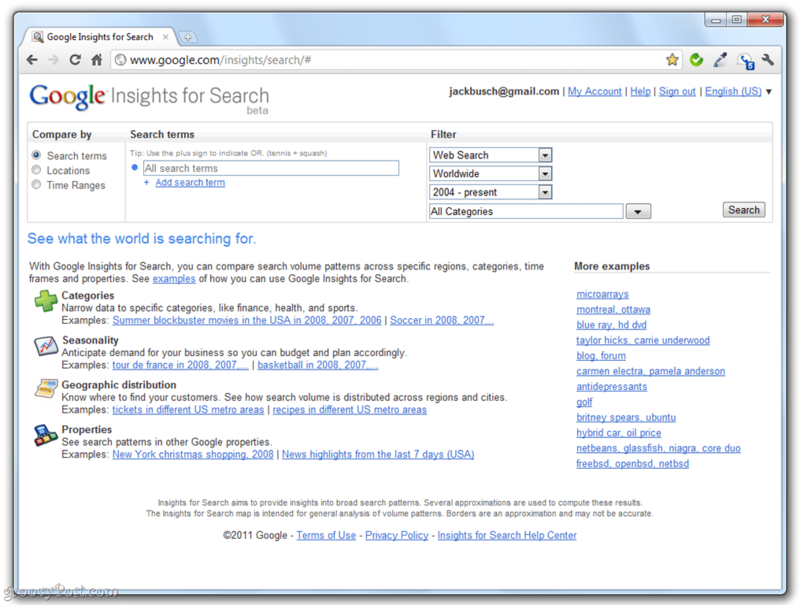 Search terms – Shows top related searches by volume as well as by trend (i.e. rise in relative search volume over selected time period). Most of this should be pretty self-explanatory once you start playing with this great free tool. Using this data, you can see that, overall, people are still very interested in the iPhone, while Android and Blackberry are about tied. So, the short answer here is that we should probably invest more in the iPhone starting out and then ramp into the Android market followed by Blackberry. Now that is sweet. I had no idea this thing existed. I’m already thinking up all kinds of tools.